7 November should have been a celebration of 30 years of MRT operations. Instead, we were awash in collective shame because a few of our staff had let us down. They did not do what they were entrusted to. Their supervisors assumed that nothing would go wrong just because it hadn’t gone wrong before. Possibly they thought no one would notice, or care. Maybe it was always deemed to be someone else’s problem. Integrity. Ownership. Responsibility. We want these to be seated deep inside each one of us. Without these, things can go horribly wrong. As it did. We had worked so hard to come this far, but when some of us fail to do what’s right or do the right thing, we have nothing more to say but apologise to the nation. 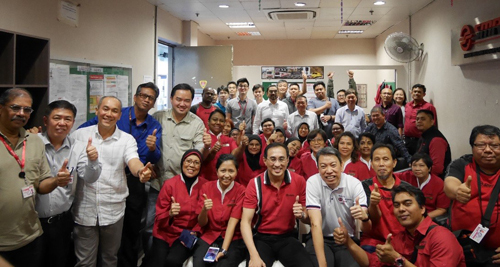 Chairman, CE Trains and I did so on behalf of our SMRT family. We must take the lessons seriously. We have not lost if we learn. It is not the mistake that defines a person or an organisation, but how we learn from it, rising to be stronger and better. We must, and we will. Our SMRT journey continues. This will be a crucial new beginning for SMRT if we commit ourselves to a culture of discipline and excellence in providing safe, reliable, commuter-focused public transport services that Singaporeans can be proud of. Together we have made great progress on many fronts across the company. Let’s resolve to do even better with our work habits, attitudes and behaviour. When you see or sense a wrongdoing, make it your duty to step forward to correct or report it. Encourage open communication with your fellow workers. Every day, we uphold trust and open reporting without fear of reprisal from our superiors. Managers and supervisors must be responsible for the performance of their teams. Every team must be accountable for the actions of each member. We are only as strong as our weakest link; don’t leave anyone behind. Infuse everyone with the strongest sense of pride and professionalism by showing them that what they do each day matters to our achieving our shared mission. I know that many of you already do. Thank you for leading by your example. On this 30th anniversary, let us all, each and every one of us, resolve to do what’s right, wherever we are and whatever we are entrusted to do. Take responsibility, walk the talk, own the outcome. Every one of us counts, and when we each do our part, we will fulfill our vision every day – moving people, enhancing the lives of everyone who journeys with us. Let’s press on. We will get there.